Ten endurance athletes performed two exhaustive intensive endurance exercises (Ex1: 21±7 min; Ex2: 18±6min) on a cycle ergometer at 110% of their individual anaerobic threshold (maximal lactate concentration at Ex1: 9.7±2.3mmol·l-1, Ex2: 9.5±2.2mmol·l-1). Ex1 was performed two weeks before, Ex2 8 or 9 days after a long endurance competition (duration: 762±74 min), respectively. 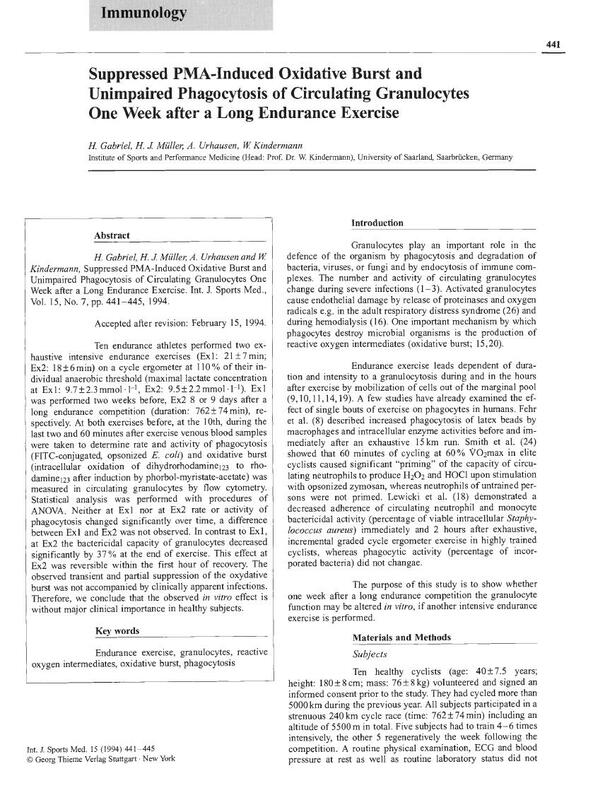 At both exercises before, at the 10th, during the last two and 60 minutes after exercise venous blood samples were taken to determine rate and activity of phagocytosis (FITC-conjugated, opsonized E. coli) and oxidative burst (intracellular oxidation of dihydrorhodamine123 to rhodamine123 after induction by phorbol-myri state-acetate) was measured in circulating granulocytes by flow cytometry. Statistical analysis was performed with procedures of ANOVA. Neither at Ex1 nor at Ex2 rate or activity of phagocytosis changed significantly over time, a difference between Ex1 and Ex2 was not observed. In contrast to Ex1, at Ex2 the bactericidal capacity of granulocytes decreased significantly by 37% at the end of exercise. This effect at Ex2 was reversible within the first hour of recovery. The observed transient and partial suppression of the oxydative burst was not accompanied by clinically apparent infections. Therefore, we conclude that the observed in vitro effect is without major clinical importance in healthy subjects.